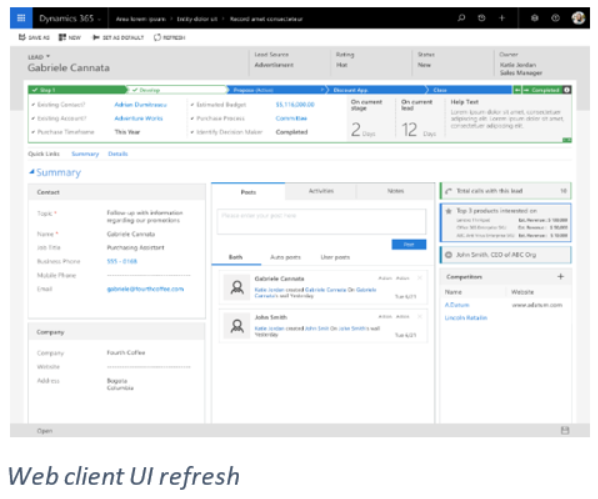 Today we’re excited to announce several enhancements and new capabilities that will be rolled out to customers of the Dynamics 365 Customer Engagement services for Sales, Customer Service, Field Service, and Project Service Automation. Business applications are used by employees to achieve outcomes like driving growth and improving customer satisfaction. Hence a continues focus on improving the productivity of the application users is important. 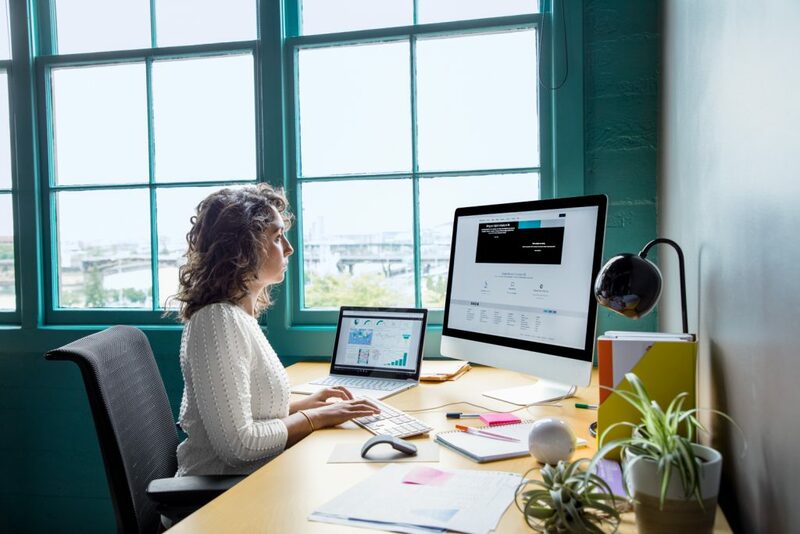 With this update, the Dynamics 365 applications get a refresh of the web user interface that will help employees achieve higher levels of productivity. The user experience includes consistent color themes, uniform page structuring and spacing, font standardization, and containers for related data. Employees today interact with business data across different form factors as they are increasingly on-the-go. It is important for them to get consistent experiences and behavior across all types of devices. With this update we have launched a new Unified Interface that not only meets the needs of road warriors but also delivers an enhanced visual experience. This framework now powers the Dynamics 365 for phones and tablets app and Dynamics 365 App for Outlook. Users will see customer data in easy-to-read ‘containers’ that streamline data entry for improved employee productivity. The new experience reduces the need for scrolling on the form and leverages enhanced use of whitespace. It also allows for text wrapping, and an updated business process experience that they can expand and dock on-demand as needed. The new timeline control gives a single sequential view of activity, notes, and posts across the time horizon that can be filtered easily to show relevant data. The record navigation experience makes it easy for employees to find and navigate to critical data with minimal clicks. 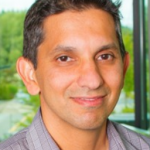 With this release, we’ve also brought Microsoft Flow in context of the Dynamics 365 user experience to provide the user direct access to a list of active flows that are user-owned, as well as the ones enabled from their organization, to automate tasks and workflows between apps and services. 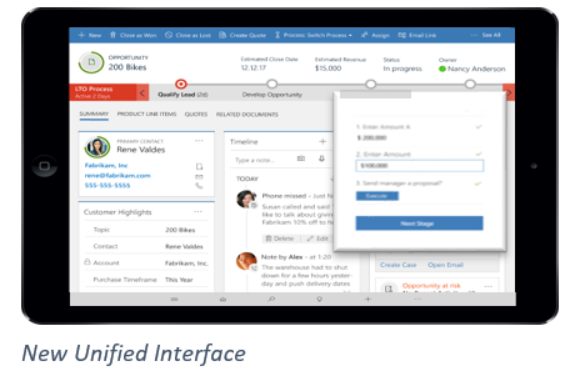 Users can invoke flows from the site map, grid, and detail forms of records. This capability is now available on all form factors: web, tablets, and phones. With Virtual entities, application customizers can easily embed external data in Dynamics 365 without writing any code or replicating data. Customizers can integrate this external data into Dynamics 365 grids, forms, lookups, sub-grids, and find at runtime. You can use this data by creating a data source for your OData endpoint. For more advanced requirements, developers can implement their own data providers to suit their specific needs. Activity Logging and Security Information and Event Management (SIEM) systems integration with Dynamics 365 enables auditing and analysis of create, read, update, and delete actions, admin operations, and login events. This release enables scenarios for basic forensic investigation, reporting, access to SIEM systems, monitoring, and compliance. New customers and trials for these Dynamics 365 Customer engagement applications (Version 9.0) will receive these updates as of today. Existing customers will start receiving these updates later this calendar year. We hope you are as excited as we are with this new update! Your feedback matters! Our products and services get better with your continued use and guidance. Please continue to submit product ideas by using the Dynamics 365 ideas portal and check back to see what other users are proposing or voting on. In addition, to learn more about our roadmap, please visit http://roadmap.dynamics.com.